I have been busy - a ton of new artwork to show you!! I am also on my way to Europe at the moment, spending some time at my studio in London, then visiting through Paris & Munich. While I'm gone you can still place orders at Strangeling.com, still bid up at eBay, buy stuff at Etsy, the galleries, etc. - the only delay will be on new orders for Limited Edition (Hand Embellished) canvas prints - those have to wait until I'm back home to ship (August 15) since I need to paint them by hand =) All previous orders have now already been shipped. 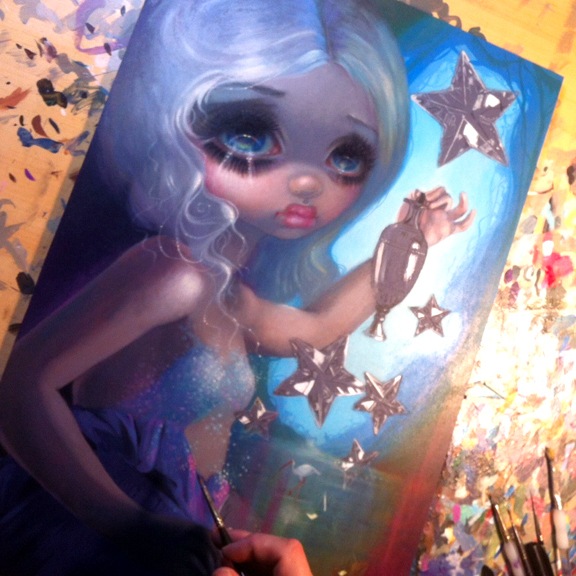 I have some new work-in-progress photos to show you - one is for "The Star" (for the Lowbrow Tarot project show at Alexi Era Gallery in Oregon) and the other is for "Femme Fatale" (for the Femme to Femme Fatale show curated by Beautiful.Bizarre magazine at Modern Eden Gallery in San Francisco). Details of both are below! And finally in other news - next month I'll be back home in Florida and doing several upcoming shows in the area! August 20th I'll be at Disney Springs at the Marketplace Co-Op (and yes, they'll have my new Princess Leia and my Princess Jasmine there!) details are here . Then the next weekend - August 27th I'm in Disney Springs again but at Pop Gallery for the release party for my Halloween Coloring Book - details are here . Then the next weekend (Labor Day Weekend) I will be at DragonCon in Atlanta September 2-5th details here while simultaneously the same weekend in Kansas City my sister Amber will be opening my gallery at the Kansas City Renaissance Festival (I'll be there in person October 1, 2, 8, and 9) details here. Then wrapping up, back to Disney Springs September 10th for another event at the Marketplace Co-Op, details here . 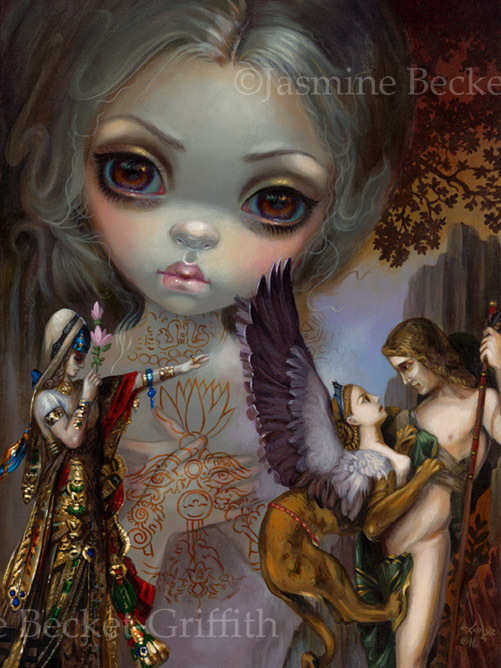 This piece debuted & sold as part of my “Allusions and Allegories” show at the Corey Helford Gallery in LA. “Allegory of Decay” is the specific allegory on this one. I’ve used the painstaking process of hand painting tiny squares to simulate a pixelated “mosaic” simulating a fake “censored” area. Referencing Dutch Golden Age “Vanitas” still life imagery (skull, roemer) there are a couple of lovely maidens (kind of a “death & the maiden” idea), one of which has a slightly undead look…. There is also some significant insect activity in this one – cockroaches, silverfish, maggots, etc. Icky! But I love this one. "Tableaux Vivants III: Salome and the Sphinx"
This is the third piece in my "Tableaux Vivants" series - my series combining my original rococo style portraiture set amongst tiny tableaux "living images" from exciting historic paintings. This one is inspired by Gustave Moreau - French symbolist from the 1800s, specifically Salome and Oedipus and the Sphinx. The beautiful henna-like ornamentation on the large figure is also inspired by the "tattoos" Moreau covered his characters with in his later work. 12x18" Acrylic painting on Panel - Price will be $5000 - email auniakahn@me.com at Alexi Era Gallery if interested! Work-in-progress! "The Star" is my card for the Lowbrow Tarot - a tarot themed book & exhibition being held at Alexi Era gallery at their new Eugene Oregon location! "The Star" is a fun card - it has a lot of great symbolism traditionally - it's a "hopeful" card, with the main figure always pouring out two water jugs (she has one in her other hand too). I always equate the figure in The Star with the ancient Greek Goddess of Youth - "Hebe" - she always has a couple of pitchers/cups pouring from either hand, so I have given her some of the classical aspects of Hebe as well. The stars will be sparkling as crystal - almost glowing - and the lower half of the painting will be in rich warm tones (magenta), with the uppermost corner around the primary star done in cool blues (as shown). She's an acrylic painting and is a slightly unusual size - 12x18" to fit precisely into the tarot card format the show is using. If you look closely you'll see a lovely ibis bird (the type that sometimes lands in my backyard in Florida!) in the distance - they are usually in the background of the Star cards in traditional tarot decks like the Rider Waite, etc. And of course eventually I'll have prints, etc. up for sale as well at Strangeling.com - the show opens August 5 so that will be her official debut!